The Erie economy is status quo. That's been the trend for more than a decade and while holding course is better than falling behind, the Erie economy lags behind both the Commonwealth and the nation in economic growth. Erie's gross domestic product (GDP) — the value of a regional economic output — grew at a rate of just under two percent during the past fifteen years, according to reports by the Pennsylvania Department of Labor and Industry. When compared with GDP growth of 24 percent statewide and 30 percent nationally, the outlook becomes somewhat less optimistic. Erie's stagnant economic output is due in part to the fact that the local economy has not diversified at the rate of other metropolitan areas across the country. 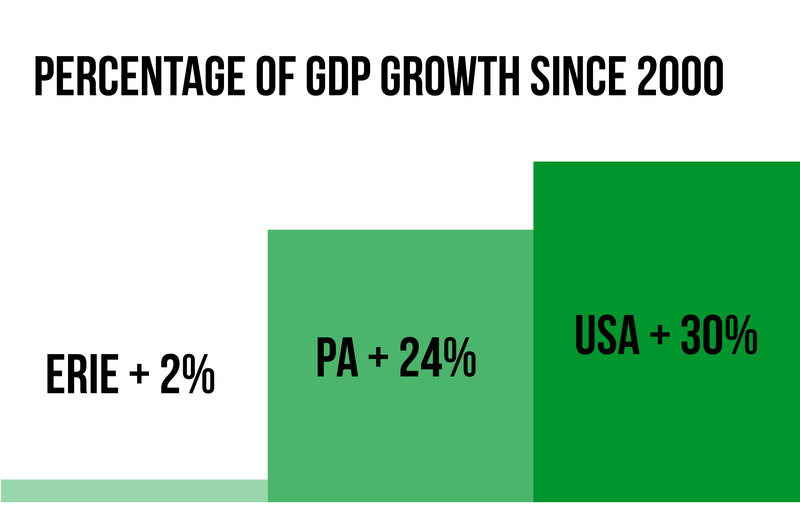 Traditional manufacturing still accounts for 22 percent of the local GDP, while the sector accounts for only 12 percent of GDP both in Pennsylvania and nationally. While many areas of the country have already begun to transition toward tech-based manufacturing of products and services, Erie's economic absorption of the decline in traditional manufacturing during the past 35 years has primarily been through the expansion of government, healthcare, and education. Nevertheless, the collective momentum of initiatives at various stages of community engagement are promising as Erie industries look to diversify and positively impact the disparity between Erie's GDP and that of the Commonwealth and the country during the past fifteen years. "There are lots of positive things happening in Erie," says Ken Louie, director of the Economic Research Institute of Erie. "With Bayfront development, the Erie Refocused comprehensive plan, the Innovation District, these are all exciting things. If these things take root and help make the Erie economy more dynamic, then hopefully that will narrow the gap." Among those positive things happening in Erie is a boom in the industrial sector that makes computer and electronic products that began in 2015. "That sector has grown like gangbusters," Louie says. "If you compare the output in that sector in Erie to the growth rate in the state and the nation, it's a faster growth rate in Erie. 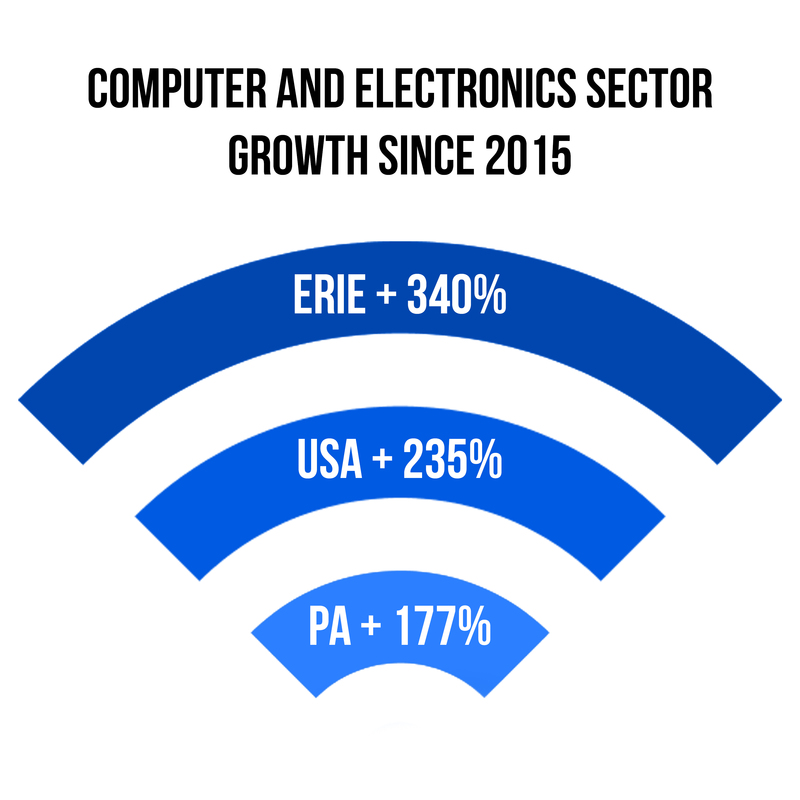 In Erie, computer and electronics products output grew by more than 340 percent, in PA it grew by 177 percent, and in the U.S. by 235 percent. That sector is very dynamic across the country, but the growth rate has been especially high in the Erie economy." One hypothesis is that skilled workers who are leaving larger manufacturing firms like General Electric, for example, are transferring their knowledge base to small startups, serving niche parts of the industries in which they formerly were employed or branching into other advanced manufacturing sectors. These companies tend to be smaller, often with just a few employees, but that makes them more nimble competitors than traditional industrial behemoths. "This is one of the more positive aspects in the evolution of the Erie economy," Louie believes. The rise of small, independent firms rooted in technical industries since 2015 has also helped fuel the expansion of Radius CoWork, located in the Renaissance Center in downtown Erie, and it helps to validate the establishment of the Innovation District, which is the collaborative effort of Mercyhurst University, Erie Insurance, Velocity Network, and McManis and Monsalve & Associates, as well as UPMC, Ben Franklin Technology Partners, Dell EMC, and MCPc to cluster assets and industries in a geographic corridor that facilitates partnerships and knowledge-sharing. While the small startups may not yet have scaled up to the radar of the Innovation District, their success is integral to stabilizing the Erie economy long term. That's because they tend to provide family-sustaining wages at a time when Erie lags nearly 8,000 dollars behind the state and the nation in this category as well. That's the difference between a bus pass and personal transportation, or the difference between renting property and owning property. It also means that while more than 800 jobs have been added to the local economy in the past year, primarily in retail and hospitality industries, overall employment — or the number of people actually working in the Erie region — fell by approximately one percent, which suggests that working people are supplementing their household incomes with more than one job. "The jobs we've been losing since 2015 are the ones at bigger manufacturing firms like GE which are historically better paying jobs," Louie says. Those include blue collar jobs as well as white collar jobs, executive positions and third-party vendors that serve as links in the industrial ecosystem. As the region moves through 2018 and beyond, the momentum created in the more diversified industries that invest greater shares of capital in research and development will continue to play a more significant role in the overall economy. Without them, the relative stability of status quo economics will be put at greater risk and will present significant challenges to the investments of economic change being carried out by various stakeholders in downtown Erie and throughout the region. Dynamic industries will require dynamic leadership, as well as dynamic partners in business and government, to nurture, attract, and retain forward thinking talent. Rest assured, that network has no patience for the status quo. Jim Wertz can be reached at jWertz@ErieReader.com and you can follow him on Twitter @jim_wertz.